you can cancel up to 2 weeks prior to arrival. Security Desposit for Stag/Hen/bachelor parties can be requested. Deposit will be returned in full if there are no damages incurred in the property. Please inform us in advance for groups of 10 or more so we can prepare in advance. 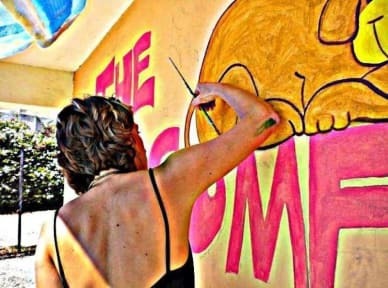 The Comfy Hostel/Studios is the only Arty Hostel in Corfu with different colour themes. Free WI-FI. We are 10min drive from Corfu town, the bus is every 20min. 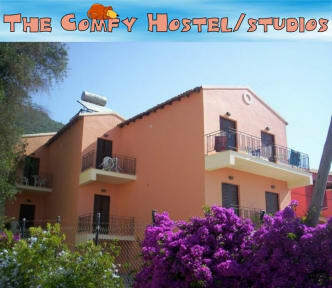 As our Hostel is family-run, we try to offer as homely and relaxed atmosphere as possible for everyone. Our rooms consist of (2) beds, private, bathroom, toilet, 1 small kitchen area, kettle, with fridge and (fan ). 2nd towel is free. All our rooms have a balcony and there is a communal area in the Hostel garden ,but if you prefer the sea, the Ipsos beach is a 500m walking distance from Comfy Hostel! For any of you who wish to experience the night life of Ipsos, there are plenty of bars and nightclubs, in the area - plus a medical-clinic. There is a wide variety of Restaurants, internet-cafes and Tavernas situated on the Ipsos beach front, some offering lovely traditional Greek food and others various International cuisine. !Try a nature walk through typical Corfu villages or a hike to Pantokrator which are all within easy reach of our hostel.A 20min walk to the crystal clear waters of Barbati or a boat trip to Kassiopi with a view of Albania en route is another option. Prior to your arrival, we can send you a detailed bus directions, (Please inquire through email, Sms text before you arrive or to our reception staff at the Hostel). As we are Locals of the area and of the island, we can recommend activities and places to visit during your stay. For some of you that prefer a more Urban and tranquil stay on the island of Corfu, we can recommend places based in a more organic and natural setting, like Bio-restaurants, yoga spa,retreat centre activities, secluded beaches etc. Please don't hesitate to call or email us for more information or help. I had a great stay here and would 100% recommend it. Great proximity to the beach and nice walks. I love Corfu and my stay here made me love it even more. I paid for a dorm but there were only couple of guests, so each of us got an individual room. That's awesome. On the other hand, hostel is bit hidden and I couldn't find it with the directions given on hostel world. It should go like that: Hop off the bus on the last stop and go back ca. 200 meters. Turn right when you see butchers shop and go streight for another 500m. Football pitch on the right, hostel on the left, next to villa Elena. The hostel was empty when I got there, but the price was good and the french couple who were volunteering were helpful. Overall was okay--it's a bit far from Corfu and the beach wasn't that amazing. But our room was clean and nice, and the staff were very friendly. Wifi didn't work very well. Alright place, standard rooms with alright beds. Nice but small balcony with some basic chairs, good toilet. Dreadful shower, nowhere to put the showerhead, often not completely hot, water spraying in all kind of directions. Not good. This place is ok, but could be a bit cleaner. It's not totally close to the main road but there are still a few small shops and restaurants around.